Six Wellesley women were recently awarded Fulbright scholarships: Carolyn Bonner Campbell ’13, Claire Ames Fogarty ’12, Rebecca Danielle McClain ’13, Rebecca Ruhl ’13, Christina Moriah Smith ’13, and Madeline Rose Weeks ’11. Four are currently completing their senior years at Wellesley and two are recent alums. They follow a firm tradition of Fulbright leadership, as Wellesley students and alumnae have won 113 Fulbright awards since 2000, according to Ellie Perkins, director of fellowship programs for the Center for Work and Service. The Fulbright website says the Fulbright Program is "the flagship international educational exchange program sponsored by the U.S. government and is designed to increase mutual understanding between the people of the United States and the people of other countries.” The program was established in 1946 and is run under the Bureau of Educational and Cultural Affairs at the U.S. State Department. Carolyn Bonner Campbell ’13 won a Binational Business Internship to Mexico. The Business Internship program is part of the Fulbright research program. Campbell will conduct an internship with a company in Mexico and enroll in graduate courses at the prestigious Instituto Tecnológico Autónomo de México, located in Mexico City. “I am hoping Mexico will be a stepping stone to a longer career path,” said Campbell, who seeks to explore the role of the private sector in economic development. Campbell will graduate in May with a degree in economics and a minor in Chinese language and literature. During her time at Wellesley, she has pursued her interest in international development, such as studying economics in Chile during her semester abroad and interning with the World Bank in Washington, D.C. Campbell participated in the Madeleine Korbel Albright Institute for Global Affairs in 2012, Wellesley’s prestigious three-week program on interdisciplinary approaches to global leadership. She is also a fellow in the inaugural partnership of Wellesley's Women World Partners initiative, and she is the student liaison for the 20 Wellesley students who will travel to Beijing in June 2013 for an Albright Institute-style program with 20 students from Peking University and faculty members from both institutions. Fogarty cites classes in Spanish, women’s and gender studies, history, and cinema and media studies as composite inspiration for her Fulbright assistantship. Her experience learning Spanish was particularly meaningful, both at Wellesley and during her time studying abroad in Puebla, Mexico. Rebecca Ruhl ‘13 received a Fulbright English Teaching Assistantship to Russia. Ruhl majors in history and Russian language and literature. Ruhl became fascinated with Russia as a child. When she came to Wellesley, Ruhl began studying Russian language and took advantage of month-long trips to St. Petersburg and to Lake Baikal. She then spent a semester studying abroad in Moscow, an experience that made her decide to return to that country after college. Ruhl will teach English to Russian university students and hopes to become actively involved with the community where she is placed. One of her plans is “to start a pen-pal program between my local Russian elementary school and my hometown school in Pine Bluff, Arkansas, where my mother is a first-grade teacher,” she said. “My dream is that the relationship between these two schools will outlast my teaching assistantship.” In the future, Ruhl plans to integrate her love of Russia into her career plans, possibly through graduate study or diplomatic work. Smith’s Fulbright year combines her passion for education, social justice, and her own heritage. “My family is Cape Verdean, but I've never had the opportunity to meet them,” said Smith, who is from Boston. “So I aimed to learn more about my heritage by learning Portuguese and studying abroad in Portuguese-speaking countries.” In spring of her junior year, Smith travelled to Fortaleza, Brazil, through a study-abroad program focused on social justice and sustainable development. The following summer, she worked with the microcredit department of a women’s advocacy organization in Praia, Cape Verde. Smith will graduate from Wellesley in May with a B.A. in peace and justice studies and a focus on education. She said, “Education reform is my passion and this experience will be one of my first steps out of college to utilize what I've learned at Wellesley and discover how education can be used to eradicate social injustices.” After her Fulbright year, Smith hopes to participate in Teach for America and pursue graduate study in education. 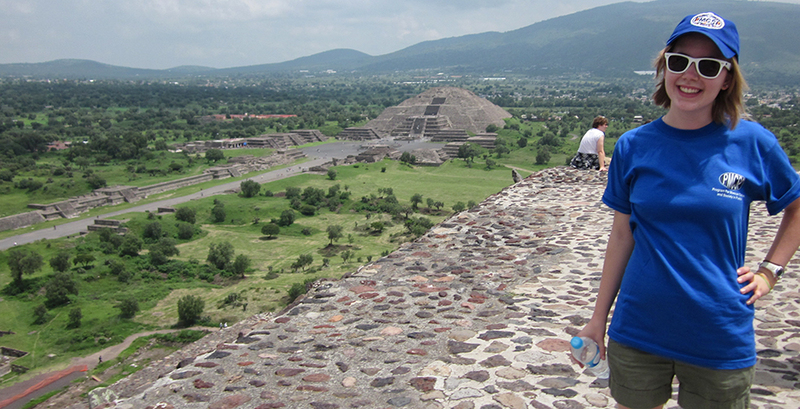 Madeline Rose Weeks ’11 has been awarded a Fulbright-Garcia Robles Grant to Mexico. Weeks will use the grant to study shade-grown coffee production in the state of Veracruz. She plans to explore the possibilities that shade-grown coffee plants produce higher-quality beans and more beneficial socioeconomic and environmental effects. During her time at Wellesley, Weeks majored in Spanish and economics. She wrote her senior thesis on the role of cacao in the transformation of Mexican society. After Wellesley, she studied at the Bill Lane Center for the American West at Stanford University. “When people ask me what draws me to Mexico, a few words come to mind: the color, heritage, good food, and centuries-long traditions,” said Weeks. “What it really boils down to is the connection I feel to the people and the land.” Weeks intends to pursue a Ph.D. in environmental studies.